Remember that line from the movie Field of Dreams - “If you build it, they will come.”? Oh, if only it was that simple for special events! 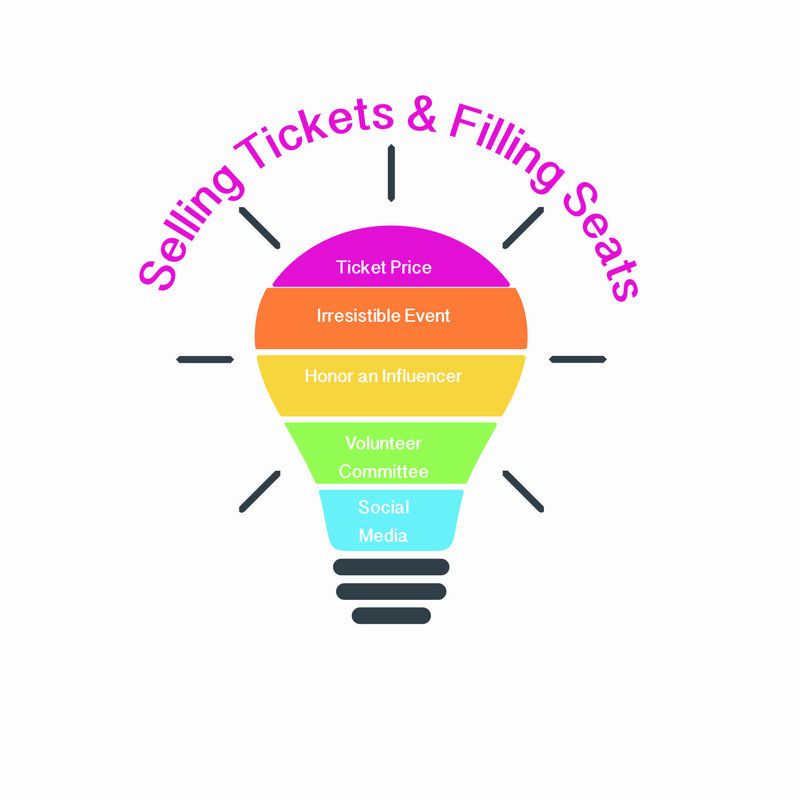 Nonprofits pour enormous amounts of energy and assets into creating wonderful events, yet we sometimes still find ourselves scrambling at the last minute to sell those unsold tickets and fill those vacant seats. As a nonprofit event planner with over twenty-years of experience, I can tell you that we all have felt the pain and embarrassment of empty-seat syndrome. Luckily, I have found some simple ways to avoid this event malady. Carefully consider what your supporters and target audience can afford. Analyze what you are offering them – if your chicken dinner costs you $35 per head, you should resist the urge to charge ten times that as a ticket price. Overcharging is a real turnoff for event goers. VIP tickets and sponsorship packages for those supporters and companies that would like to support you at a higher level. These premium priced tables should have upgraded wine and consider giving each of these special guests a lovely gift at their seat (hopefully donated by a sponsor). No one is all that excited about attending the same old year after year. To sell tickets you must freshen up your event and make it enticing to those who may be bored of the same-old program. Consider adding a theme to your event and build expectations with a clever invitation. Come up with a tag line and logo that engages your supporters’ attention. This doesn’t cost extra money and does a lot to sell tickets. An example of this is a dog rescue organization that had little luck with their traditional dinner gala, and needed something that would engage their supporters and raise much-needed funds. The answer for them was a “Dog Days of Summer” concert held on the dog rescue’s premises. They created a cute logo of a dog floating on an inner tube, and sent out casual invitations which encouraged guests to come in swim suits and frolic with the dogs. The event featured a local band, food trucks and lots of water games with the pooches. Not only did it sell out way in advance, it is now an annual event eagerly anticipated by local animal lovers. Whether they are wealthy donors or strong champions of your organization’s mission, saluting a person or corporation does much to sell tickets. When honoring a corporation you set the stage for that company to purchase tables and ad space in your tribute program. Corporations have earmarked funds for their upper level management to attend charitable events, and honoring their business ensures they will want the tables filled when they come onstage to accept their award. Similarly, honoring an influential individual brings their social circle into play when creating your invitation list. People are proud of their achievements and want to have friends, family and colleagues on hand to witness the tribute. Using dedicated individuals with strong social circles to help with your event planning not only lightens your staff’s work load, but also extends the reach of your mailing list. When people put time and effort into a project they have “skin in the game” and are far more likely to open their address books and share contacts for your invitation list. These volunteers also encourage their friends and family to attend their event just as they have supported events of those same folks in the past. All the effort your committee has put into the planning makes them determined for the event to be a success. Don’t be afraid to delve into the world of social media when it comes to promoting your event. Facebook and Twitter will build excitement as you post updates for your auctions and stage program. Make a Facebook event page that allows you to post photos and updates as your event takes shape. Have your committee extend the page’s reach by sharing and liking your posts. Facebook is also an excellent vehicle for sharing post-event details, photos and thank-yous. Twitter can build excitement and sell tickets as guests tweet their enthusiasm about attending the event. This platform can keep your event in the public’s eye which makes it more likely that they will purchase tickets. Like Facebook, on Twitter people not only can create posts about your event but they can also share your companies' posts about the event. Online calendars and “What’s Happening” websites are excellent way of capturing the attention of those who are looking for something to do on the day of your event. It is important to remember that the majority of the tickets are sold either immediately after receiving an event invitation, or two weeks prior to the actual event. Don’t panic if you have a sales slump between those time periods - continue to be enthusiastic and promote the heck out of your event. If folks don’t know about the event, they can’t buy tickets! Thanks to guest blogger A.J. Steinberg for her expert advice! A.J. Steinberg, Principal at Queen Bee Fundraising is one of the leading experts creating outstanding successful events for nonprofit and social clients. She has been doing so since 1999. A.J. Queen Bee Fundraising is a nonprofit consultant and liaison, and has become known for her success guiding volunteer committees in their production of nonprofit galas, fashion shows, concerts and street festivals..